This visit to Istanbul is my fifth and Bev’s fourth so we have visited most of the iconic attractions like the Blue Mosque, Topkapi, the Grand Bazaar and the Galata Tower but there is one place we have not visited and that’s the Basilica Cistern so today we decided to go there. The cistern is the largest of many underground water tanks in Istanbul and was built in the 6th century. Around seven thousand slaves worked their innards out building the one we hoped to visit today. Unfortunately the queue to get in was a mile long and there is one thing we don’t do and that’s queue unless it is absolutely essential like for when buying a bus or train ticket. Failing that tour we thought we would visit the Blue Mosque but there was also a queue which started at the main entrance and snaked out to near the kiosk (lower right of photograph). I did a rough head count and estimated there were around three hundred and fifty people lined up waiting to get in. It seemed we were going to be restricted to outside activities today. 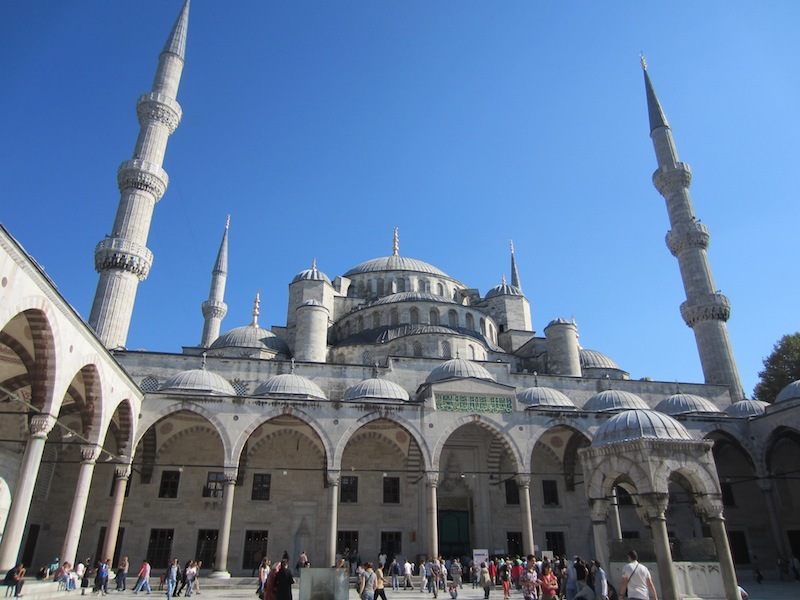 Near the Blue Mosque is the Hippodrome, an area of immense historical significance to the readers of ancient history. 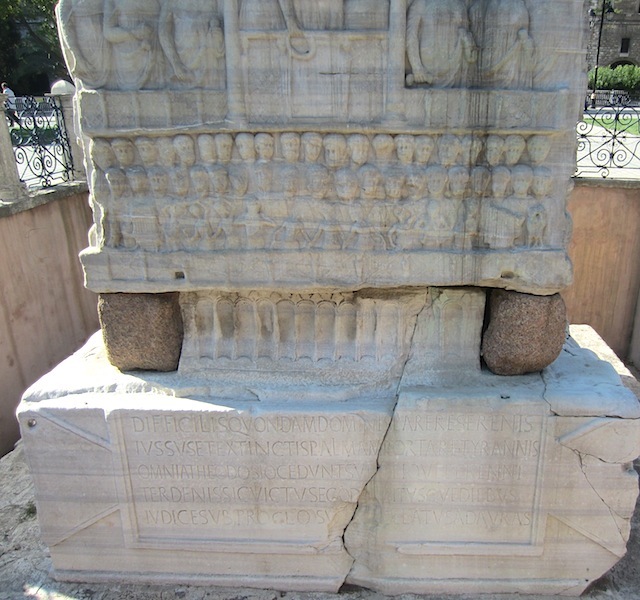 The Hippodrome was constructed in 203A.D. and was a “u” shaped arena used for chariot racing and other entertainment. Today a motorbike sped up the Hippodrome and a police car zoomed out from its hiding place in hot pursuit; so the Hippodrome is still being used for its original purpose. 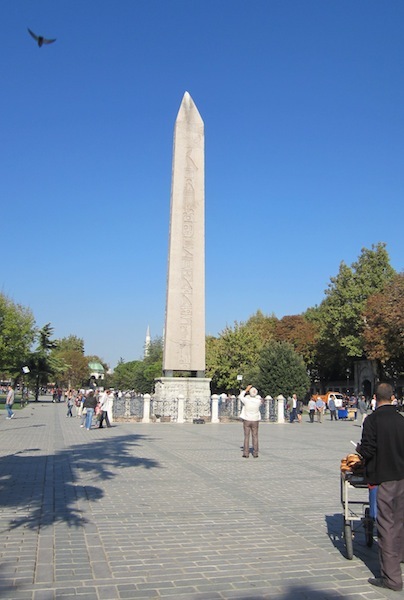 Standing in the middle of the Hippodrome is the Obelisk of Emperor Theodosius, who had it brought from Egypt and had it erected here in 390 A.D. One reference stated it was made in 1479-1425 B.C. Prior to it being erected at the present site various rulers moved it around, apparently as an exhibition of their power. Back in Egypt when it was first erected it stood 30 metres high but now it stands at a lesser 18.5 metres. Regardless, it would have required super human effort and a lot of engineering skill to get it into the vertical position as it stands today. I tried to imagine what it must have been like when it was unveiled — the hierarchy standing back and saying to themselves, ‘Not a bad job. That will impress the local plebs and let them know who’s boss in these parts now’. The keen observer will see that the apex of the obelisk is not symmetrical, it is weighted to the south (left) in the direction of Egypt. It also has a slight Leaning Tower of Pisa look. The pedestal at the base of the obelisk. The darker blocks of stone at the corners of the obelisk are pieces of porphyry; I assume they were placed there to provide added stability. Detail around the outside edge of the marble plinth. 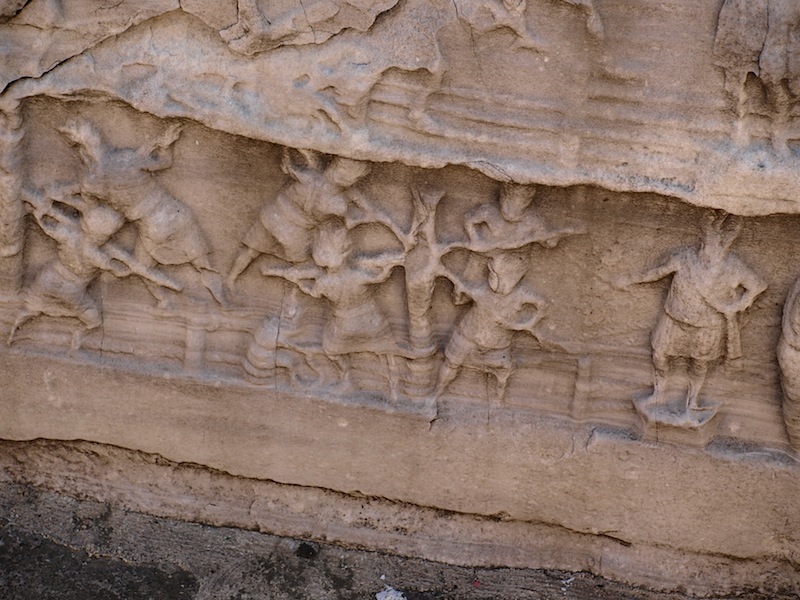 The bas-relief images on the plinth depict court scenes, the winner of a chariot race being presented with a prize and workers using a windlass to get the obelisk into position. 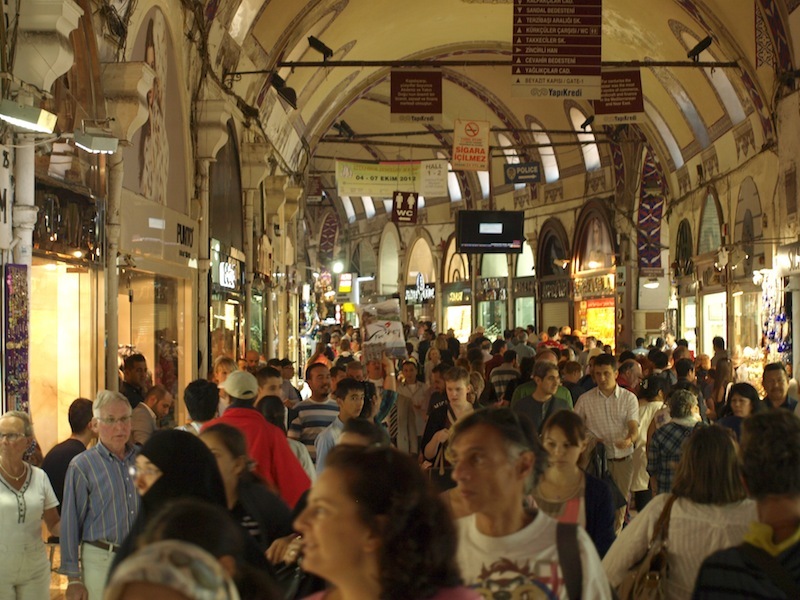 From the Hippodrome we went into the Grand Bazaar, a crowded but moving sea of people. 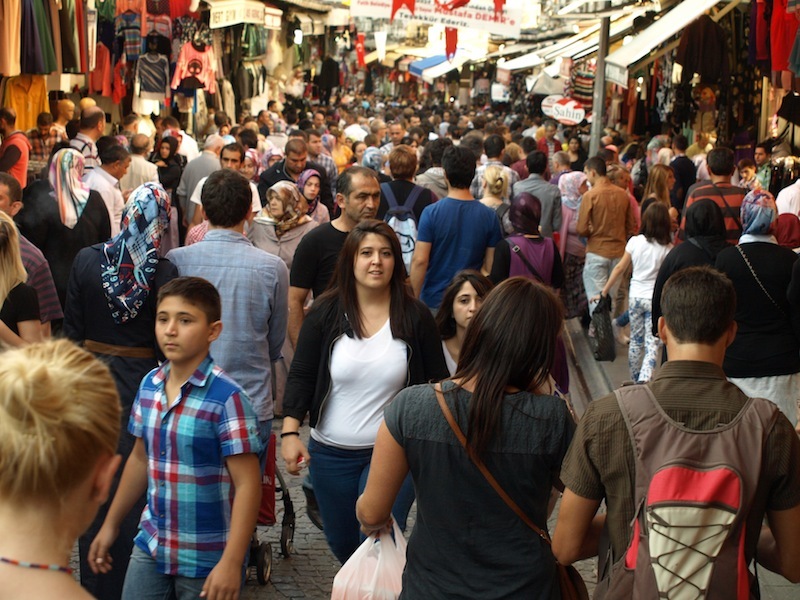 It’s reported that on a busy day like today there may be in the area of old Istanbul, where the bazaar is located, up to two million people at one time. 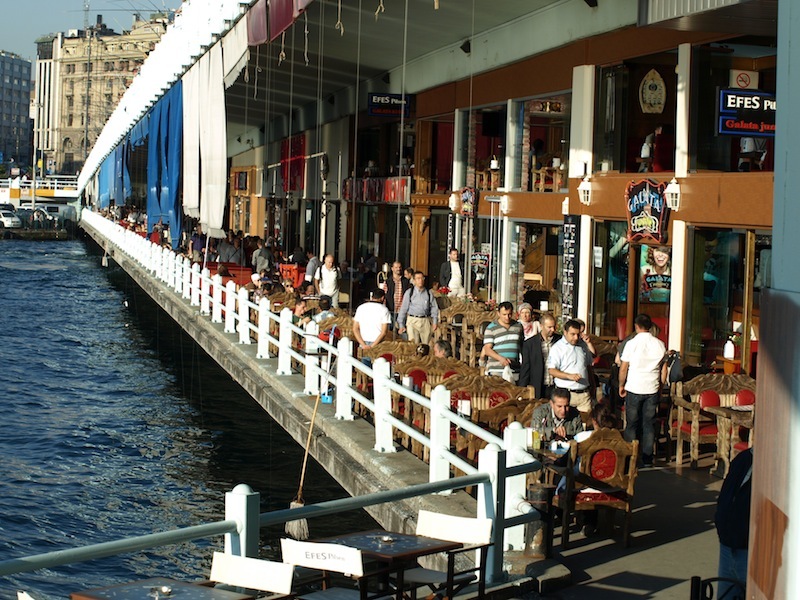 We have come to the conclusion that if you don’t the crowds the best time to come to Istanbul is in winter. All our previous visits have been mid winter and it can be extremely cold but we would prefer the cold to the people. Rugged up for winter. 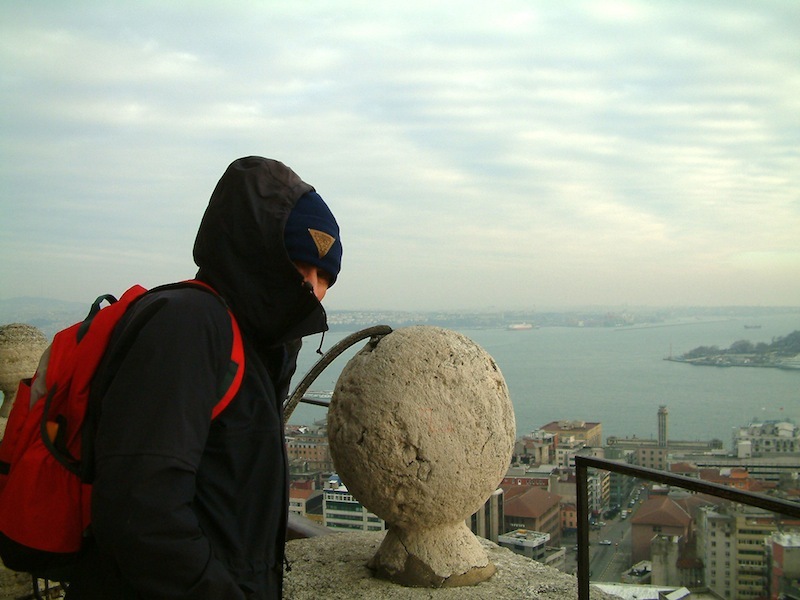 On top of the Galata Tower in 2006. 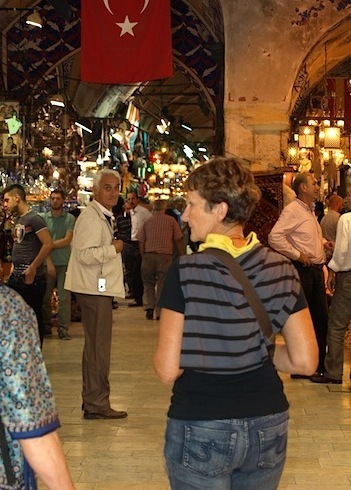 The Grand Bazaar in the old quarter of Istanbul. 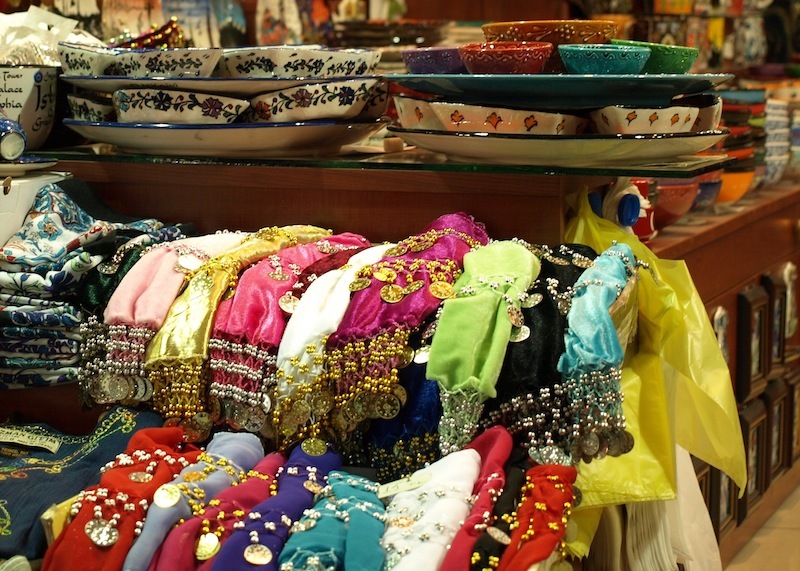 Istanbul is at the end of the Silk Road and so Istanbulites have been selling, trading and wheeling and dealing for centuries so when accosted by touts it’s better to think it’s their culture rather than think it is an annoyance. Today one tout grabbed my arm and attempted to pull me into his shop so desperate was he to sell me something. 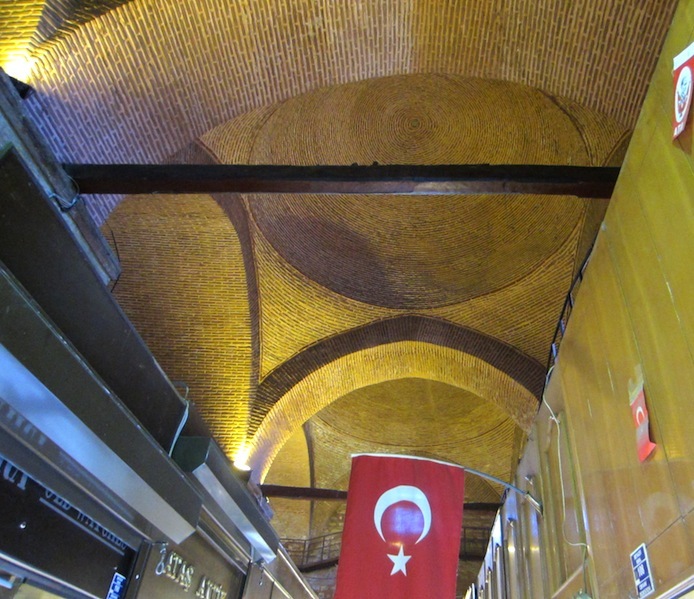 Vaulted roof in the Grand Bazaar. 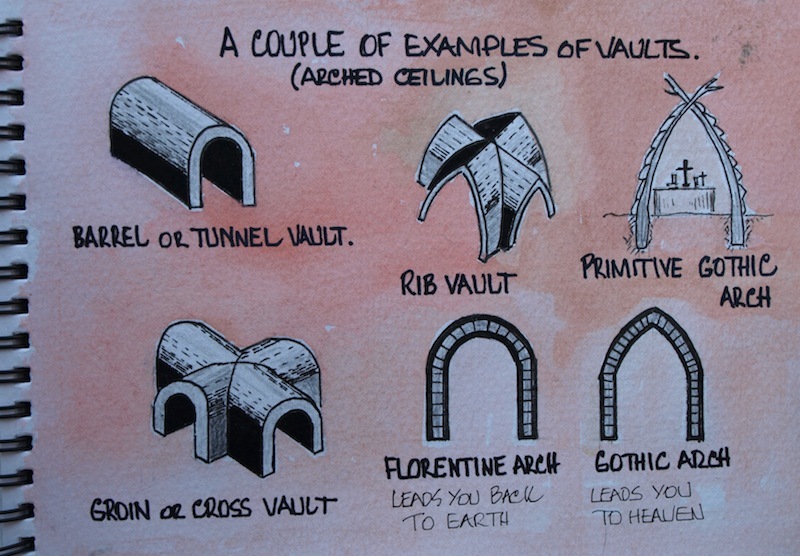 I think this vault could be described as a Groin vault. It’s nothing compared to the decorated ceiling in the following image but what I like about this view is it allows one to see the placement of each individual brick. Amazing. A Tunnel vault with inset windows. The yellow and maroon ceiling colours here are actually small glazed tiles. In fact, it’s a huge mosaic. Sketch shows various arch types. I should explain the primitive arch. The first altars were simply a small enclosure made by burying four saplings in the ground. They were pulled together and at the top secured. Thatch was placed on the outside to form an enclosure. When the saplings were secured in this way they formed an arch now refer to as the Gothic arch. The Gothic arch was reserved for use in religious buildings only because the point represented heaven. 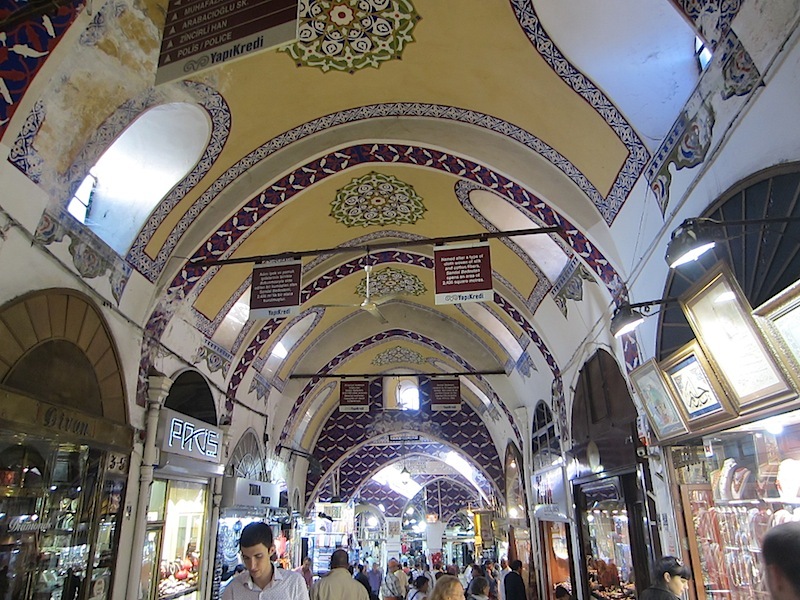 Ferruh leads us through the bazaar. He was constantly turning to make sure we were not lost or waylaid by the touts. Bev and I have a strategy when in crowds. Before we enter a crowded forum we decide on a place to meet in the event of misplacing each other. We have the address written in the local lingo on a piece of paper and money in case a taxi is required. We have never lost each other yet but today there was one anxious moment when we lost sight of each other but because I always wear my hat (locals do not wear hats) it’s easy to spot me. Fire is the big danger when in a crowd like this. You are more likely to die by being trampled to death than by suffocation if a fire was to start. I know it is impossible to think of every eventuality but it’s good to have a plan like keeping to the edge of the crowd so you can grab a wall projection to hang onto in a stampede. 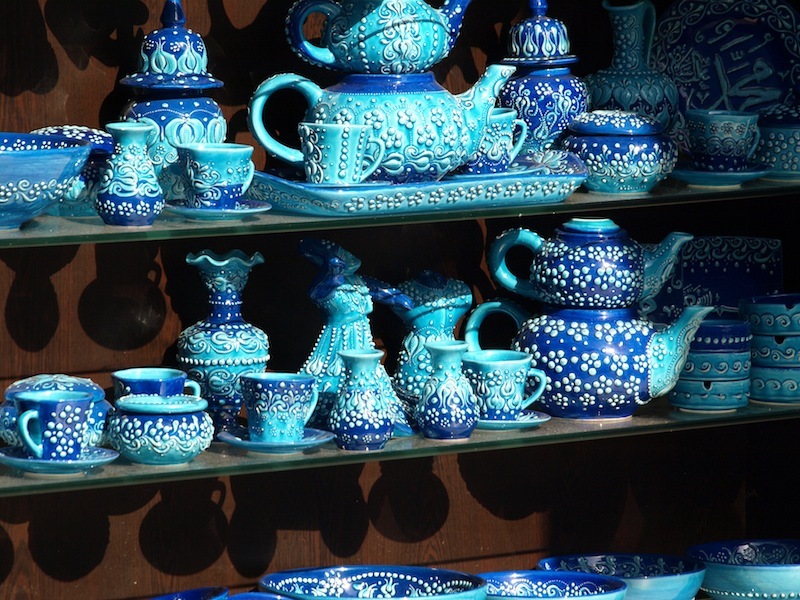 There is nothing you can’t buy in the Grand Bazaar. There are many antiques for sale but you have to be careful. You know the old adage, ‘Beware of gold bracelets filled with sand’. Another beware factor is pickpockets. When in a crowd like this one realises the value of a money belt. 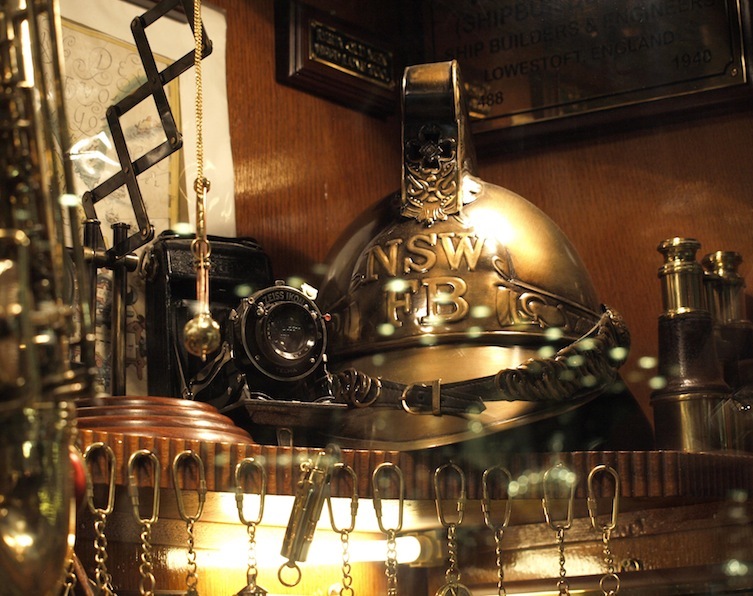 A NSW fireman’s helmet in a bazaar antique shop. Anybody my age knows that NSW Fire Brigade helmets were not as flimsy-looking as this one. The originals were heavy-duty solid polished brass. However I’m sure the seller of this helmet would guarantee it was genuine. 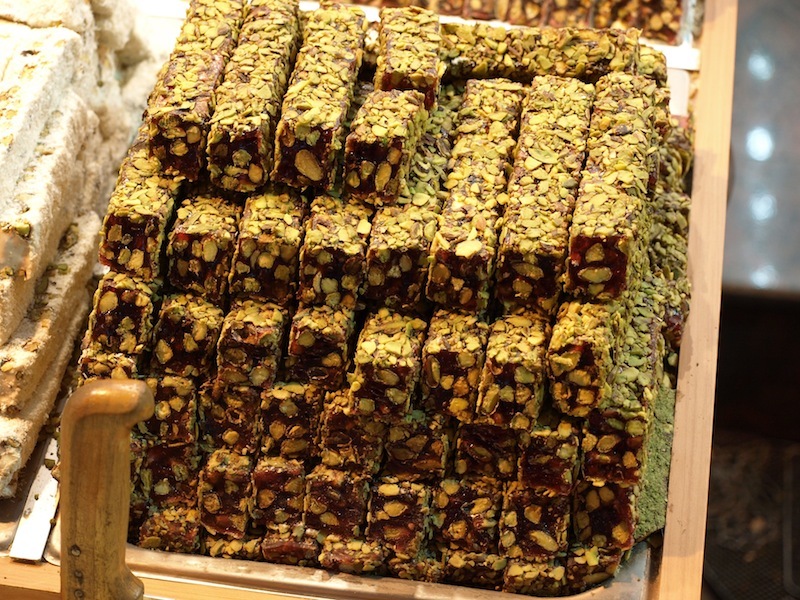 Turkish Delight coated in sunflower seeds. Old world tea set. If you will excuse the pun, ‘not our cup of tea’. A modern teapot, more to our liking. The top pot contains strong tea and the bottom one has hot water. The hot water in the bottom pot keeps the tea in the top pot hot and is available for adjusting the strength of tea in your cup. 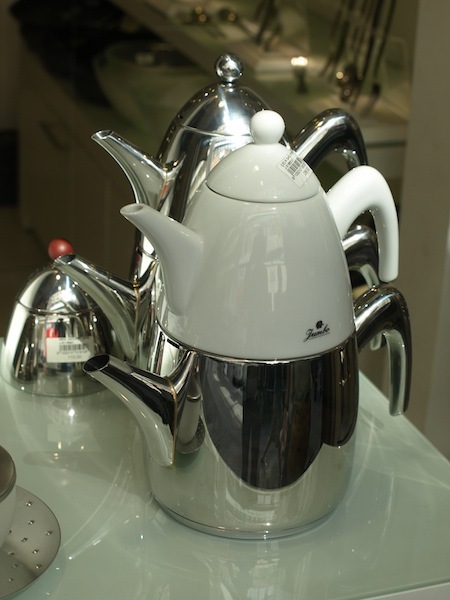 One of the things about travel is you get new ideas; I’d like to make one of these teapots when I get home. Steve, is there a grammatical definition for a phrase such as ‘top pot hot’? Caviar is unfertilised fish egg. 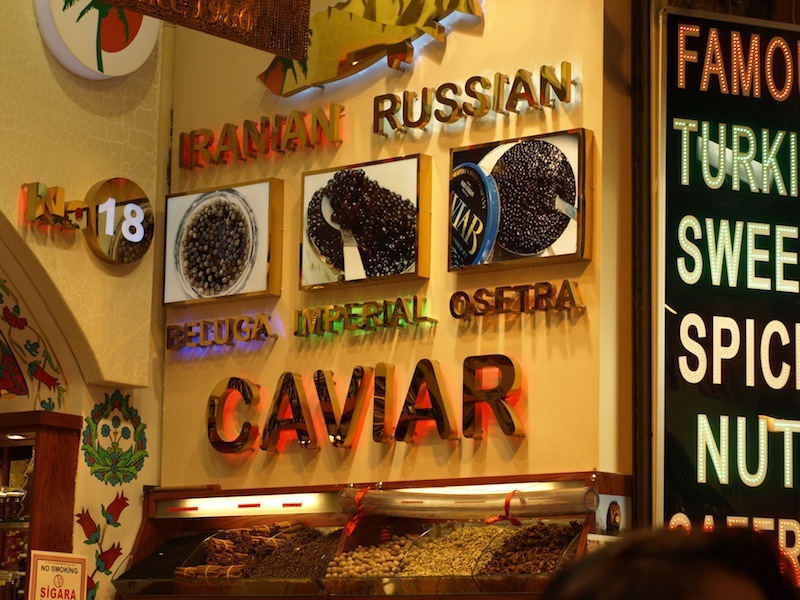 Most people think that Caviar comes from the Sturgeon species of fish but this is not strictly true. The word sturgeon is the common name for a number of fish harvested for their eggs and because these fish are slow growing they have been exploited to the point that are on the critically endangered list. 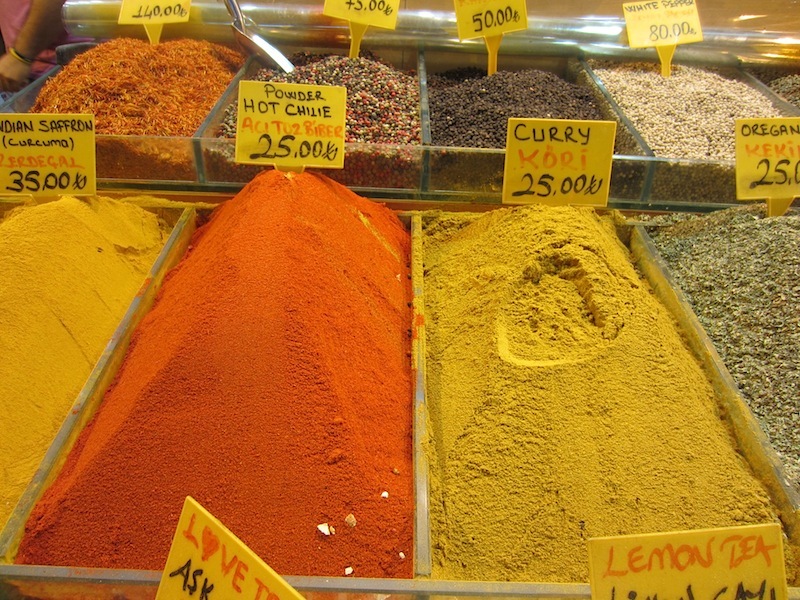 Spices in the Grand Bazaar. Chilli lovers’ delight! 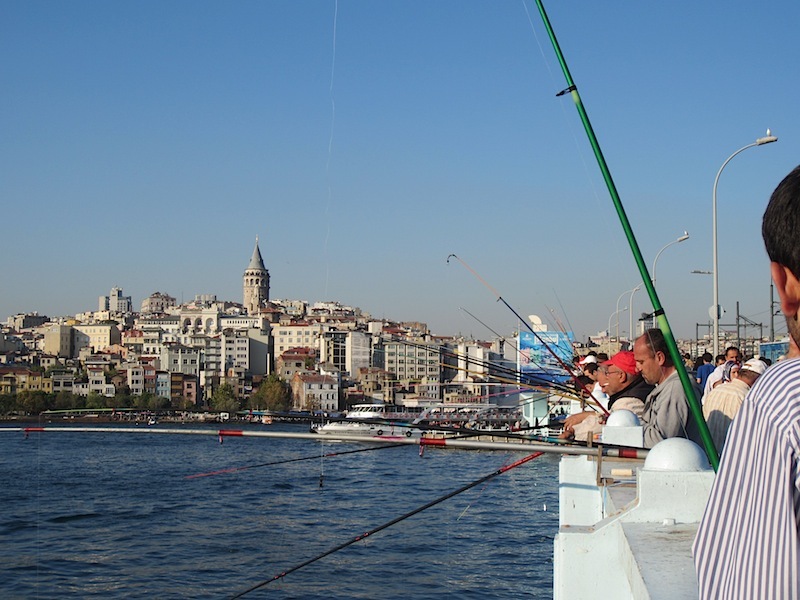 Leaving the Grand Bazaar we headed for home across the Galata Bridge. 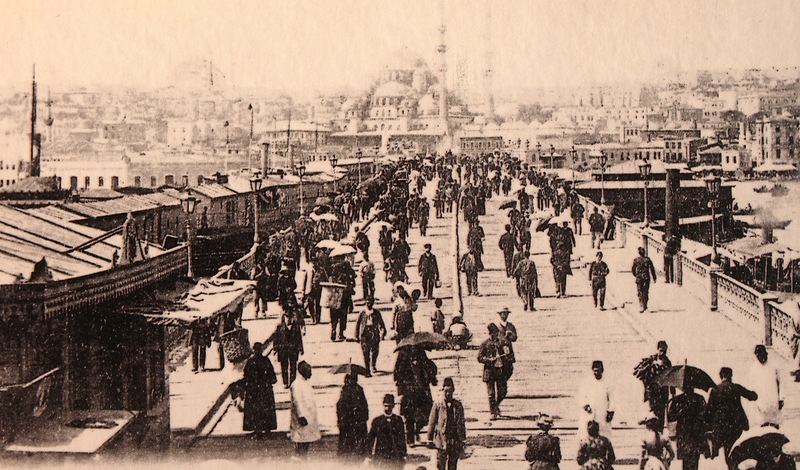 The Galata Bridge across the Golden Horn in the late 1800s. Under the bridge these days it’s wall-to-wall restaurants; the actual thoroughfare is between the diners’ tables. On top the bridge. Fishermen line its entire length like this every day of the week. A thoroughly exhaustive day but worth the effort, even though we had to rub shoulders with the masses. Love the brick vaulted roof, amazing! Love the old world teapot set! The modern one should be called the Fred and bev set, the one with tea for Bev and the hot water for Fred 😉 Turkish delight looks awesome.